The Cobra MT270K 5-in-1 Multi-Tool is powered by a 26.3cc Kawasaki engine. It includes 4 quality attachments - grass trimmer, brushcutter, pole pruner & long reach hedgecutter together with an extension shaft. 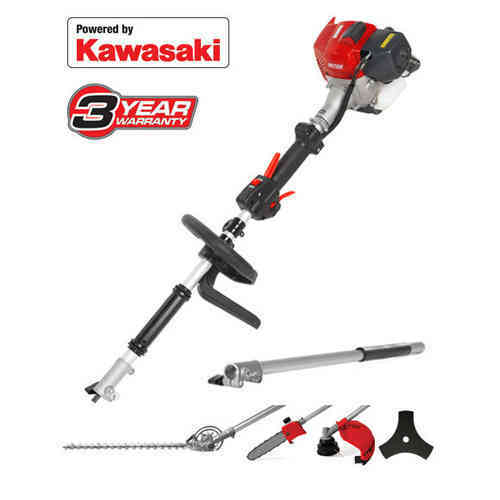 Kawasaki engines provide all the power your Cobra Multi-Tool needs. The 2-stroke engine produces consistently strong power delivery together with state of the art engine technology, whilst achieving reduced fuel consumption and industry leading low emission levels. Experience faster, cleaner and more effective cutting with the Cobra MT270K 5-in-1 Multi-Tool Tri-blade. The heavy duty metal blade makes clearing larger areas of brambles, shrubs and saplings even easier. The result is a cleaner cutting system, stopping clogging enabling more efficient use of energy and easier handling. Even easier to cut at various cutting angles.The innovative design of the articulating head means that you can easily and smoothly adjust the angle of the cutting blades through 180° at varying increments. The Cobra MT270K petrol Multi-Tool comes complete with a 72cm shaft and is fitted with a 62cm / 24" double sided cutting blade with 30mm tooth spacing. Double sided blades are more suitable for shaping, as you can alter the direction of the cut without moving around as much and with extra versatility.